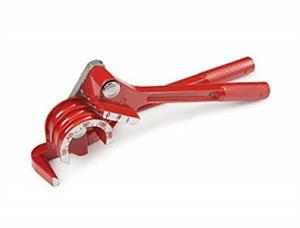 A strong, sturdy construction allows the TEKTON 6519 Tubing Bender to smoothly bend metal without any crimping. Strength and durability is ensured with a rugged cast alloy construction and baked enamel finish. Grab the non-slip, knurled grip handles and effortlessly bend copper, brass, aluminum, and thin-wall steel to angles up to 180 degrees. The three-channel design accommodates 1/4, 5/16, and 3/8 in. O.D. tubing, making this tool ideal for several water, gas, refrigeration, and brake line applications.